It is with great sorrow to report the passing of Lyla Aster (Evenson) Erickson. Below is the obituary that was posted on November 16, 2011 in the Brainard Dispatch. 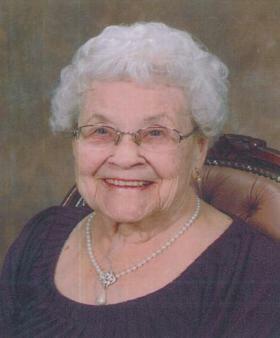 Lyla Aster (Evenson) Erickson, 97, passed away at Edgewood Vista Assisted Living in Brainerd, Minn., on Nov. 15, 2011. Services for Lyla will be on Monday, Nov. 21, 2011, at 11 a.m. at Bethany Lutheran Church in Remer, Minn. Visitation will be one hour prior to services at the church. Interment will be at Fairview Cemetery in Remer, Minn.
She was born in Walker, Minn., on Oct. 12, 1914, to Henry and Marie Evenson. Her family was one of the first white settlers in northern Minnesota after the turn of the 20th century. She had four brothers and 3 sisters that were very close throughout their lifetime. She is survived by one brother, Homer, Torrance, Calif.
Lyla married Lewis Erickson on June 10, 1933, on the family homestead in Walker, Minn. They made their home in Boy River, where Lewis and his brother owned a garage. Lyla ran the grocery store and the post office. In 1943, they moved to Remer and started the Ford garage and gas station. In 1964, they built the L and L Drive Inn. Lewis passed away in 1978 and in 1994, Lyla moved to Brainerd to be close to her daughter, Tammy. Lyla is survived by two sons, Gaylord (Eric) (Del), of Fremont, Wis., Sydney (Eve), of Los Altos, Calif.; one daughter, Tamra, of Brainerd, Minn.; two granddaughters, Dawn (DeBoer) Fisher (Tom), Dena (DeBoer) Storm (Mike); six grandsons, Jeff (Mia), Steven (Amy), Michael (Donna), Guy (Toni), Eugene (Joanne), Gaylord (Gayn) (Trisha); 14 great-grandchildren; five great-great-grandchildren; and many nieces, nephews and cousins. She was preceded in death by her parents, Henry and Marie; husband, Lewis; three sisters, Agnes, Laura and Helen; three brothers, Oral, Harris and Milton. Lyla was a member of Bethany Lutheran Church in Remer, and she loved quilting with the ladies aid at the church. Her favorite pastime was playing cribbage or 500 and she won her share of cards. Her grandson, Guy, named her “Grandma Sweetcheeks” because his son said she had such sweet cheeks! Everyday she made sure her makeup and her jewelry was on. Lyla enjoyed time with her family and friends. She was very happy visiting relatives that came from all parts of the United States to attend the Evenson family reunions. These reunions were held every five years on the old Evenson homestead near Walker. In lieu of flowers memorials can be made to the American Cancer Society or Heartland/Home Care and Hospice. Arrangements have been entrusted to Brenny Funeral Chapel in Baxter. We love you and your family and friends will miss you. This entry was posted by admin on Friday, November 18th, 2011 at 11:16 pm	and is filed under Blogging, Death. You can follow any responses to this entry through the RSS 2.0 feed. Both comments and pings are currently closed.